Cuisinart Elite Collection 12-Cup Food Processor. Includes 12-cup large bowl and 4-cup small bowl with pour spouts & measurement markings. Includes stainless steel adjustable slicing disc (1 to 6mm) stainless steel adjustable shredding disc (fine/medium) large and small stainless steel chopping/mixing blades with blade lock system and a dough blade. Electronic touchpad controls - On/Off/Pulse with blue LED lights. Measures 13.2in x 18.8in x 11.5in; 19 pounds. The item "Cuisinart Elite Collection 12-Cup Food Processor" is in sale since Saturday, May 26, 2018. 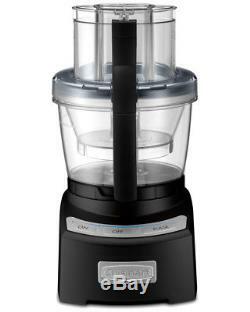 This item is in the category "Home & Garden\Kitchen, Dining & Bar\Small Kitchen Appliances\Blenders (Handheld)". The seller is "la_via" and is located in Shepherdsville, Kentucky. This item can be shipped to United States, Canada, United Kingdom, Denmark, Romania, Slovakia, Bulgaria, Czech republic, Finland, Hungary, Latvia, Lithuania, Malta, Estonia, Australia, Greece, Portugal, Cyprus, Slovenia, Japan, China, Sweden, South Korea, Indonesia, Taiwan, South africa, Thailand, Belgium, France, Hong Kong, Ireland, Netherlands, Poland, Spain, Italy, Germany, Austria, Israel, Mexico, New Zealand, Philippines, Singapore, Switzerland, Norway, Saudi arabia, Ukraine, United arab emirates, Qatar, Kuwait, Bahrain, Croatia, Malaysia, Brazil, Chile, Colombia, Costa rica, Dominican republic, Panama, Trinidad and tobago, Guatemala, El salvador, Honduras, Jamaica.